It was a lucky (and unlucky) coincidence. The day of my first visit to Manzanar coincided with a special event, the Guard Tower Dedication, Saturday, September 17, 2005. Guard Tower 8 now stands four stories tall on its original site on the perimeter of the former relocation camp. Eight such towers surrounded Manzanar when it housed Japanese Americans forcibly removed from their homes during World War II. Constructed to match the original, the tower’s rough pine timbers look raw against the sage of the surrounding desert. The site is enclosed in barbed wire, as it was sixty years ago. As we drove into the Manzanar National Historical Site we saw that rows of chairs facing the new tower and a speaker’s platform were empty. Groups of people clustered under several white awnings enjoying the last of the lemonade and cake. Others headed for their cars. The ever-present wind whipped against my face, pleasant on an 85 degree day. Because of the tower celebration I had the good fortune to meet two people whose work I much admire. The dedications and music, the speeches, remembrances and poetry reading all happened while my husband and I paced about in a service station in Big Pine, CA, waiting to get a verdict on our car’s suddenly sick-sounding transmission. The previous day we drove 400 miles across Nevada’s Highway 6, the “loneliest road in America,” through Tonopah, to get to the Owens Valley and the east side of the Sierra Nevada where Manzanar is located, 45 miles south of Bishop on US 395. 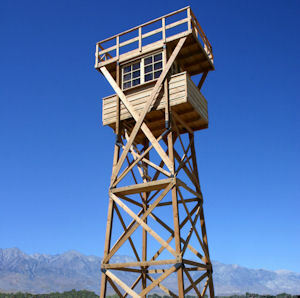 The next day’s Los Angeles Times described a moving and eloquent recognition of the internment experience: “Construction of the guard tower is a milestone because it shows most directly the constant threat under which detainees lived.” Guard towers were manned around the clock by military policemen armed with submachine guns, shotguns and 30' caliber rifles, all directed inward. Invited speakers celebrated the tower as the iconic memory for the 10,000 Japanese Americans who were forcibly detained in the Manzanar Relocation Center during World War II. For me the reconstructed tower offers one more illustration of the self-serving falsehood of Karl Bendetsen’s late-in-life fantasy that there was no barbed wire, that there were no guard towers, no guns, no searchlights (as spelled out in The Colonel and the Pacifist.) Attendees at the dedication, many of them former internees, spoke of the reality of being imprisoned behind barbed wire, of how it felt to be watched at all times by armed MPs. The auditorium of the former Manzanar High School, which except for the tiny stone guard post at the entrance, is the only building surviving from the wartime camp, has been restored to serve as the Visitor Center for the Historical Site. It contains a comprehensive interpretive display about the internment experience and life in Manzanar from 1942 to 1945. Inada got up and shook my hand. I wished that my husband had brought our video camera at that moment. Returning to his chair, Inada continued talking about my book: he remembered my last name and the title of the book, and proceeded to make a great pitch for it – a spontaneous testimonial about how this book gives the full story about Karl Bendetsen’s role in pushing for the decision to evacuate, and how important that is, and what a fine man Perry Saito was. Those were five memorable minutes. Inada went on to interview everyone in the audience including several park personnel, drawing out recollections of camp from several other former evacuees. 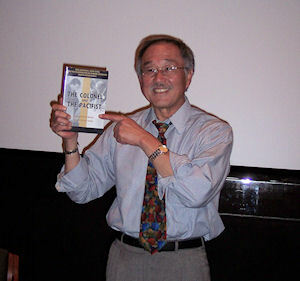 He talked eloquently through his memory of camp, of growing up Japanese American, of the day’s events. When he decided to stop he said to me, “Let me hold up your book” and said more positive things about The Colonel and the Pacifist. I bought a copy of his Legends from Camp at the book signing. Though I’ve read most of the hundreds of books about the internment and studied many photos of the camps, including Manzanar, (and visited three other camps) I wasn’t prepared for the scale of the place. It is enormous, and contains many relics of its former residents. Many trees planted by the Japanese Americans have survived among the sage brush, and skeletons of the more elaborate Japanese gardens sit in silent witness to the enforced interruption in the lives of its residents. It still amazes me that our government committed personnel, troops and money to evacuate and incarcerated so many innocent people based solely on their national ancestry, and that our supreme court in 1944 upheld the lawfulness of that evacuation.